Phillis Levin's fifth collection of poems encompasses a wide array of styles and voices while staying true to a visionary impulse sparked as much by the smallest detail as the most sublime landscape. From expansive meditation to haiku, in ode and epistle, dream sequence and elegy, Levin's new poems explore motifs deeply social and historical, personal and metaphysical. Their various strategies deploy the sonic powers of lyric, the montage techniques of cinema, and the atavistic energies of the oral tradition. Throughout this volume, the singularity of person, place, and thing--and the plurality of our experience--assert their uncanny presence: an ash on a crackling log, a character from Alfred Hitchcock's The 39 Steps, a burgundy scarf, an x-ray of Bruegel's "Massacre of the Innocents," and a demitasse cup from Dresden are all woven into a collection by turns rhapsodic and ironic, caustic and incantatory. The pre-Socratic mathematician Zeno facing the riddle of an ordinary day; a cloudbank of silence; a pair of second-hand shoes bought for Anne Frank; two crows at play above the peak of a mountain; a dot flickering on the horizon: intimate and philosophical, these poems unveil the metamorphic properties of mind and nature. 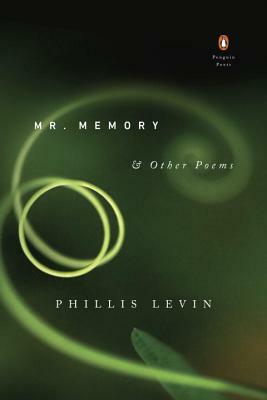 Phillis Levin is the author of four other poetry collections, Temples and Fields, The Afterimage, Mercury, and May Day, and editor of The Penguin Book of the Sonnet. She has received the Poetry Society of America's Norma Farber First Book Award, a Fulbright Scholar Award, the Amy Lowell Poetry Travelling Scholarship, a Bogliasco Fellowship, and grants from the Guggenheim Foundation and the National Endowment for the Arts. Widely anthologized, her work has appeared in The New Yorker, Poetry, Paris Review, The Atlantic, Poetry London, Southwest Review, Yale Review, Agni, Kenyon Review, and The Best American Poetry. She teaches at Hofstra University and resides in New York.